Douglas Falls doesn't usually have much water, but it's high and free-falling. It's in what used to be a beautiful, majestic hemlock forest, but the big hemlocks are dead due to Hemlock Woolly Adelgid infestation. Unfortunately, the hemlocks were one of the things that made this place worth visiting, so it's quite disappointing to see them gone. And be careful over the next 10 - 15 years, especially on windy days, as they decay and crash to the ground (if they're not removed). Still, it's an easy 1/2 mile hike to the falls and it's in a virgin forest with some other big, beautiful trees. Take US 19/23 north/I-26 west for about 11 miles. Take exit 15 for Jupiter/Barnardsville (NC Hwy. 197). Turn right toward Barnardsville and follow NC 197 about 6 miles to the town of Barnardsville. Turn right onto Dillingham Road, just past the old fire station and the downtown area. It's about 6 miles from there to the National Forest - stay on Dillingham Road the whole way. Bear left where Haw Branch Road goes straight; left again at Dillingham Presbyterian Church and the Stony Fork Road intersection; right just past the church at Town Branch Road after crossing a narrow bridge. The road will cross two more narrow bridges and then turn into gravel FS 74 (Map Point B), which marks the Forest Service boundary. It's 8 miles from there to the Douglas Falls parking area at the very end of the road - just continue straight on the main road all the way. 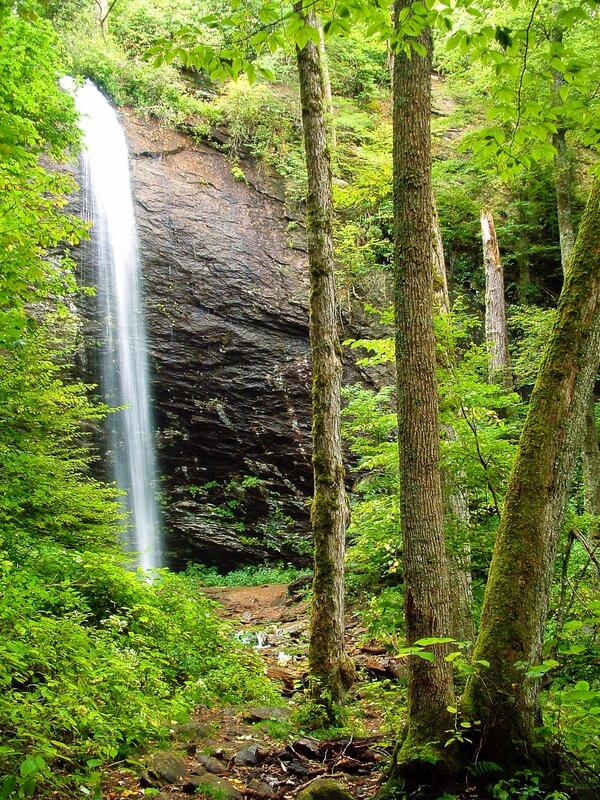 Douglas Falls is easy to access for families with kids, making it popular. Follow the gently-descending Douglas Falls trail for about 1/2 mile to the base of the falls. The trail starts in a deciduous forest, but moves into a (former) hemlock forest closer to the stream. It's wet in places, and a few areas have some small rock obstacles. One section - where a tree fell and took the trail with it - is a wet, sloping rock that can be tricky to navigate. The hemlocks are now dead, so use caution here - especially on a windy day - for falling debris.